UNC marine microbiologist Andreas Teske and doctoral student Luke McKay are searching the Gulf for life forms that could shed light on the impact of the oil spill and be helpful in the clean-up. Using dozens of water and sediment samples taken in the Gulf in the wake of the BP spill, Teske and his team are conducting various experiments, such as identifying which microbes are present and how they are responding to the spill.They are collaborating with colleagues at UNC and elsewhere to propose various novel “rapid response” projects that could play a role in monitoring and tackling the spill disaster. 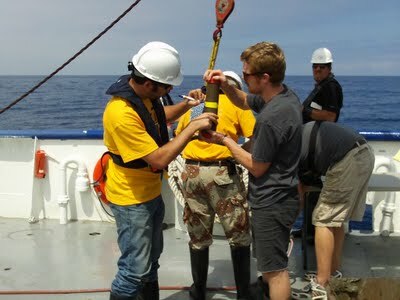 McKay and several graduate students have been working in the Gulf on research expeditions studying the spill and the surrounding area. McKay was aboard one of the first research expeditions to visit the site and surrounding waters shortly after the spill began to unfold. He sent several days on the RV Pelican in early May, helping gather water and sediment samples. See more details and photos in the News and Observer. Click here for details on what Teske, McKay and other UNC scientists are doing to understand and address the Gulf oil spill. Our students keep making us proud, but we’re not surprised. Four new graduates of UNC’s College of Arts and Sciences made USA Today’s All USA College Academic Teams: Libby Longino, Jimmy Waters, Henry Spelman and Lauren Teegarden. Libby and Henry are Rhodes Scholars; all four students had full four-year merit scholarships to UNC. Click here to learn more and to read the USA Today’s coverage. PlayMakers Reaches Out, Football Fallout, Hotel Rwanda Revisited…. 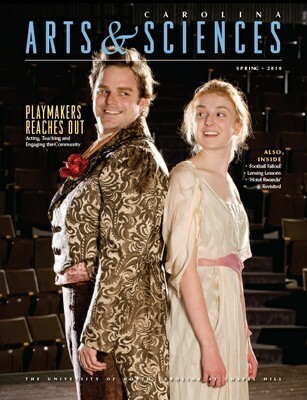 These stories and more are available in the Spring 2010 issue of Carolina Arts and Sciences magazine. Our semi-annual publication is mailed to faculty, alumni and friends who have made a gift to the College, and is available to all online. UNC historian and folklorist William Ferris spent the 1960s and 70s traveling the back roads of his native Mississippi tracing the roots of American blues music. He found them in church halls, prison fields and rural homes, where he recorded and filmed African American musicians and storytellers. Like everyone in PlayMakers Repertory Company, Jeff Meanza plays multiple characters in The Life and Adventures of Nicholas Nickleby. The company’s most ambitious undertaking ever runs on the Paul Green stage through Dec. 20. Wyatt Bruton ’11 spent last summer in Beijing, where he worked at a public relations agency during the week and taught in a migrant village on the week-ends. UNC and partners at the University of San Francisco – Quito, Ecuador, are developing a living laboratory to prevent ecological damage in the fragile Galapagos Islands. Learn more.